Born on a drowsy basset hound, Sarafleana is a natural jumper. Snoozer the hound is actually home to a community of fleas; his pelt even boasts its own acrobatic troupe, The Fleatastics. Sarafleana and her siblings easily impress Mr. Itchy, the troupe’s leader, and Sarafleana seems destined for the tippy-top of the Parasite Pyramid. But that would mean staying still, and she doesn’t want to. Earning acclaim as “THE HIGHEST-JUMPING FLEA EVER” is her dream. One morning when Snoozer is at the dog park, the flea circus packs up and parachutes to Sparky, a dog napping nearby. As the crew sets up the circus tent and the hot dog stand, Sarafleana secretly practices. The circus begins, and Sarafleana’s siblings build their pyramid. She goes to the top, planning to impress everyone with her jumping. But, inexplicably, she can’t leap. The show continues and is at its fleanale when a child in the audience calls out for “another TREAT!” Uh-oh. Sparky perks up and starts to scratch, threatening the flea circus. Sarafleana becomes a hero by jumping all over and shouting “Treat,” distracting Sparky and allowing everyone to flee to safety. 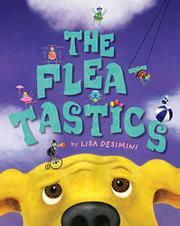 Desimini’s story is more than a bit disjointed, but her universe of fleas delights with boundless imagination and pockets of hilarious flea dialogue, vivaciously depicted.